One of the most popular products our father had on display in the family watch business was his home-cured olives. Every year he would buy fresh olives from local farms and prepare them according to the same methods his family had used in Cyprus over many generations before him. One year he asked me to type out some of the recipes to share with friends and family who were also interested in curing their own batch of olives. While doing so, I happened across an article highlighting some of the many health benefits associated with olives and olive oil. Further research also revealed that South Africa was producing some amazing olive products (most notably olive oil), but that the industry was struggling to compete against much cheaper imports. The juxtaposition of a struggling industry with a world-class product called for more research, the summary of which I submitted to an online publication in New York called the Olive Oil Times who invited me to be a guest correspondent and a couple more articles followed. These developments eventually lead me to taking a marketing job at a local olive estate where I was exposed to various aspects of the industry. 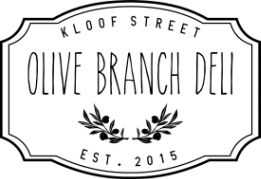 A year after opening the Olive Branch Deli, we began the process of establishing our own olive oil brand - known as Early Harvest Olive Oil (EHOO) - in collaboration with Hestie Roodt from Lettas Kraal Olive Farm situated in the Touw Valley between Touws River and Montagu. EHOO is made according to an ancient tradition of pressing young green olives to produce an emerald-green oil which is rich in polyphenols and intensely grassy, bitter and pungent (the three organoleptic properties all extra virgin olive oils should exhibit). Inspired by the earliest forms of olive oil storage and transportation whereby Roman potter's moulded large amphorae from indigenous materials, our vessel for the inaugural harvest is a handcrafted ceramic urn made from clay found in the Western Cape. EHOO forms part of a collection of over 100 different local and internationally-sourced olive oils currently on offer at the Olive Branch Deli.